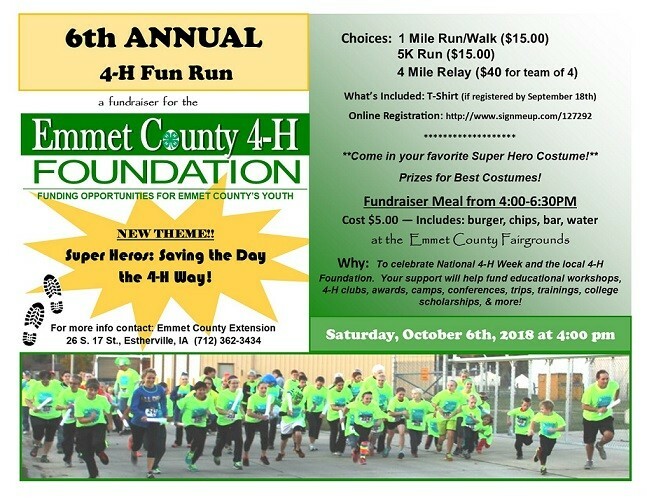 The 6th Annual 4-H Fun Run, a fundraiser for the Emmet County 4-H Foundation, is Saturday, October 6th at 4:00 PM! The run will kick-off at the Emmet County Fairgrounds. Events include a 1 mile run/walk, 4-mile relay (team of 4), and a 5K. NEW THIS YEAR is our THEME – “Saving the Day the 4-H Way!” All participants are encouraged to dress up as their favorite super hero. The deadline to register in order to receive a t-shirt is Tuesday, September 18th. NOTE: you can still register after this date but will NOT be guaranteed a shirt. Register online: http://www.signmeup.com/127292, or pick up a form at the Emmet County Extension & Outreach office. Come run, walk, and most importantly have FUN at the 6th Annual 4-H Fun Run!! Don't want to run or walk in the race? You can still purchase a t-shirt for $15 – contact the office. There will also be a meal from 4:00 to 6:30 PM – OPEN TO THE COMMUNITY!! The meal includes a burger grilled by the Emmet County Cattlemen, chips, bar and beverage. Come join the fun and support your local 4-H Program and youth!